This is an invaluable guide to the planets of our solar system. 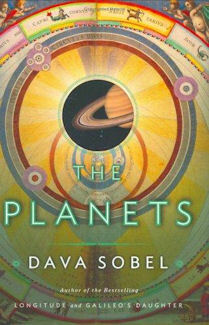 Dava Sobel’s writing style is engaging: her conversational tone is a tremendous attribute for a popular science writer. Reading her book is like enjoying a college lecture delivered by a favourite professor. Every page is entertaining and lushly textured. Her writing lifts the sometimes dry subject matter of planetary science to a literary level. Each chapter of the book tackles a particular planet in the solar system. Each is then themed cleverly. My favourite is the chapter on Saturn, where Sobel alludes to the music of the spheres, and develops the theme when explaining the intricacies of the gas giant’s beautiful ring system. Her broad usage of appropriate analogies helps the reader to make use of their imagination whilst delving through the science, helping the complex knowledge to imprint itself on the memory. ‘The Planets’ contains a great deal of detailed information, some of it historical, much of it contemporary. For the general reader it should create a marvellous introduction to the solar system and its mysteries. For the more informed reader, the book is not only highly entertaining and original, but it offers enough rare nougats of knowledge to enlighten one’s knowledge further, and make the read worthwhile. There are plenty of references to Planet X in the book, although in the context of the discovery of Pluto rather than a continuing enigma. Given the extensive description of the Edgeworth-Kuiper Belt given in the penultimate chapter I would have preferred to see a door left ajar on the possibility of a large planet still awaiting discovery. After all, many astronomers consider this a distinct possibility. Scepticism about this idea has receded in recent years. I would also take exception to Sobel’s scattered treatment of the late, heavy bombardment which seems to unquestioningly be allied to the detritus of the early solar system. If so, why did it come on so suddenly and violently? Something triggered the waves of cataclysm 3.9 billion years ago. But, you know, it’s easy to pick a few holes in a book, and not see the wood for the trees. The panorama provided by ‘The Planets’ is spectacular. The book reminds me of the writings of Dr Carl Sagan, which must have been a big influence on Dava Sobel’s literary development. I hope she considers writing a book about the newly-discovered extra-solar planets. I would very much enjoy her take on the rich diversity of this quirky collection of objects.